I don't really have anything decent to say for this first paragraph, so let's get stuck in. Here are my thoughts on Buckled Tracks and Bumpy Trucks. Talk about an absolute mess of an episode. Did no one think of giving this a re-write or two? There's so much going on here that it's hard to keep up at times. But let's get the obvious problem out of the way first: Flynn and Belle are completely pointless to the story. They put out a couple of random fires, sure, but that's all they are: random. The main focus is supposed to be the buckled track they're travelling on, yet Belle just ignores it due to low water levels. They don't even report the incident, it's just done over the phone! They could've been removed and the story would be the same. Actually, it could've been better since those role could easily have gone to far better characters. 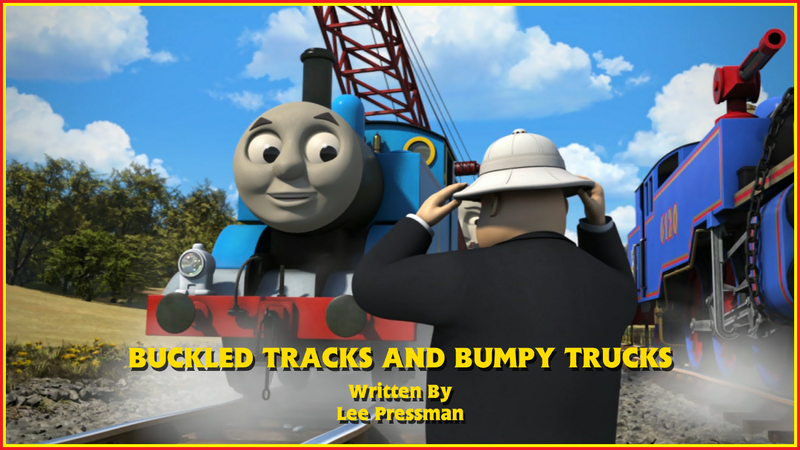 Also, do you know the Bumpy Trucks part of the title? Yeah, that's completely pointless, too. We only see trucks for about 10 seconds, and they're not even troublesome ones, just the generic green ones associated with the waste dump. It would be nice if all coloured trucks could be given faces rather than upscaling narrow gauge stock (again...) and adding faces to them. It would add more variety to trains that just seeing a dull, grey one every time we see Troublesome Trucks. I thought Mattel wanted to keep kids engaged..? Come to think of it, the Buckled Tracks part of the title doesn't really hold much weight either. They get a lot of the focus, no doubt. But we never really see them cause too much of an issue. Remember Thomas Gets Bumped? The episode where the tracks were bent, Thomas was derailed and they had to shut the whole branch line, supplying a replacement bus service, until it was repaired? There was actual consequence and urgency, two things this episode sorely lacks. Well, maybe not so much consequence since Belle ends up derailed, but you feel less sorry for her and more "serves you right for not doing anything about it sooner". The best parts of the episode, and the only ones that weren't frustrating, were the parts involving the Fat Controller. His interactions with his mother, and the safari hat, were brilliant, and it was nice that it actually tied in to the plot's resolution, although that could just be relief that something did, since everything else felt more like "throwing stuff at the wall and seeing what stuck". What also stuck was the inclusion of Toby. Granted, like the firefighting duo, he had little to do with anything, but his character was fine and maybe making him the star would've been better? Maybe give him a role akin to The Truth About Toby where he's too stubborn to report the problem? It would've worked better than not using water on an emergency situation... in case they encounter an emergency situation. I've said it before, but this is a mess, to the point where the title barely equates to what happens in the actual episode. Take Belle and Flynn out, add troublesome trucks and put more emphasis on the tracks, and the impact the damage would have on the railway, and the episode would've worked much better. Instead, only a third of it was particularly interesting or fun to watch, to it's only fair to give it a score to reflect that.